SSM-1 | Some folks like 'em, some say they stink. Pack up very compact/flat if that's important to you. A20S | The -S model just has stiffer elastic. Tensimount | Inexpensive, flexible for a variety of mic sizes. the schoeps a20 will accept the neumann x-y/ortf bar just fine. The Rycote InVision Broadcast a.k.a. INV Series shocks are awesome. IMHO: These seem to be the best designed and most durable shocks per dollar. It'd be interesting (and easy?) to do some shock mount testing.... Setup stand and mics at specific gain in a quiet room, drop object from known height next to stand, record thump, compare to other mounts, etc. Though that wouldn't cover the case where the sound pressure vibrates the stand more directly. A lot depends on whether you're recording loud material with 20dB of gain, or classical guitar at 55dB.. In photography, carbon fibre tripods are far more effective at dampening vibrations than aluminum. Wood is also much better than aluminum. Additionaly, each system has resonant frequencies that may make them better or worse than others. I wouldn't be worried about the clips (they are replaceable too). Its where they screw in that I'd have some worries on, and the hinge where the clip plate joins the threaded hole and tie off. Really? I might have to check them out then, John! They def look sweet. What's the difference between the INV-6 and INV-7? Also both mention having a 3/8" thread adapter, so will that screw onto my Shure A27M vert bar and can these Rycotes adjust in different directions. I just can't picture where the thread adapter is positioned on the shockmounts. The INV-7 has a longer bar length which can be set up as either the same length of a INV-6 or furthur apart as supplied to accommodate longer mics. Basically, unless you need lowest profile the INV-7 is more versatile. thanks for the info DigiGal. I appreciate it. The akg 460's are kinda long so I should probably go with the INV-7, but then will the 3/8 thread adapter allow me to position the mounts the way I want after attaching to the Shure vert bar? You'd definitely need to use the thread adapters for attaching Rycote INV lyres on the Shure vert bar but it wouldn't impose a positioning problem. If you look at the top of the thread adapter those are 3/8" threads that are protruding, they will thread into the base of the Rycote INV Lyre mount. Then the base base of the thread adapter is a female 5/8" 27 (mic) thread that attaches to the male 5/8" 27 (mic) thread on the Shure vert bar. The thread adapter adds maybe only about a quarter of an inch of height to the Rycote INV Lyre. It is an over site by Rycote that none of their stock photos show the thread adapters but it is really quite simple and fairly transparent when utilized. 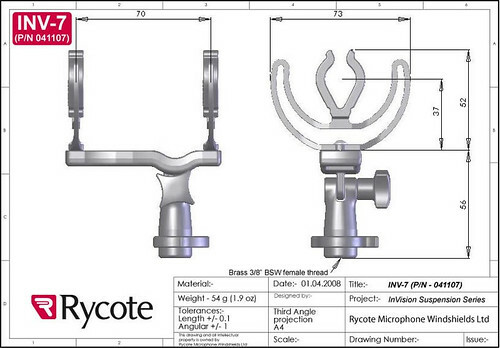 Rycote are made in UK where 3/8" mic thread is standard unlike US where 5/8" 27 is the norm. That's a perfect illustration so now I see that it would work. It looks bigger in the illustration than it really is so I "think" it would be consider low pro to have these. I currently have the Shure donuts which are too tight to fit the akg's. I'm not about to grease up or talc up the akg bodies just to fit them in those donuts lol. I was at a show last night with JD (I think it was him, his name is John) and he was clamped to me and I asked him about these but didn't ask him after the show when he took them down to demonstrate how they attach to the vert bar. Page created in 0.253 seconds with 44 queries.